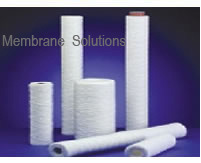 MS ® string wound cartridge filter is a kind of deep filter cartridge, which is made of the textile fabric string (polypropylene, absorbent cotton and so on) preciously winding onto the multihole axies according to the specific technology. 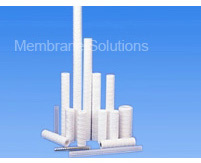 The typical honeycomb structure of the filter body gives it a considerable capacity for accumulating impurities present in the fluid being filtered. The larger foreign particles are filtered out on the surface , while smaller particles are blocked later in the inner filtering substance. Electronic industry: pre-filter for ultra pure water etc.